Want to learn everything you need to know before replacing a bathroom countertop in your Maryland, Northern Virginia, DC, Baltimore, or Alexandria home? Because all we do is sell and install countertops, we can offer you an expertise that can’t be matched by one-stop home remodeling shops. Keep reading to learn what to expect during your bathroom countertop installation process and to discover some secrets that will make your purchase more affordable. If you’d like to speak with a bathroom countertop installation and design expert who can answer all of your questions call 410-712-0601. Or click here to fill out our online estimate request form. It’s hard not to get excited about the wide range of options available when you replace a custom bathroom countertop. From surface materials, to color, to edge style, there is a lot think about when putting new bathroom counters into place—and unlike with kitchen countertops, which can take a beating, you can focus on design more than function. This is your chance to completely customize your project and select a counter that is unique to your home. Now let’s take a look at the process of bathroom countertop installation and show you how to make your project more affordable. Installing a bathroom countertop is an involved process that requires knowledge and a strict attention to detail. Here’s a general overview of the process. Your fixtures, like sinks and faucets will be checked for compatibility with the countertops that you want. This will determine whether any adjustments need to be made and where. Replacing a bathroom countertop will involve discussing the seams and where they will be placed. Plumbing will likely have to be disconnected during the project, so you will need to make plans to use other sinks in the home accordingly. Your installation will be complete within 1 week—guaranteed! After everything is complete, we will go over the project and answer any questions that you might have about the installation. This is a very general look at the process, but it gives you some idea of what to expect when it comes to replacing a bathroom countertop. Want to discover some secrets that will help make your bathroom countertop replacement more affordable? From the materials down to the colors, just about everything on your counter is customizable—this is the key to savings. Tile vs. Slab – You can save on granite countertops, by opting for tiles over slab. You’ll maintain the same beautiful natural appearance at a fraction of the cost. Countertop Resurfacing vs. New Installation – Replacing a bathroom countertop doesn’t mean you have to install a brand new one. Instead, save money by resurfacing the fixture. Alternative Materials – Reduce the cost of your project by selecting more more cost effective materials like laminate. Remember, countertops in the bathroom don’t have to withstand the same abuse as those in the kitchen. These are just a few of our secrets. 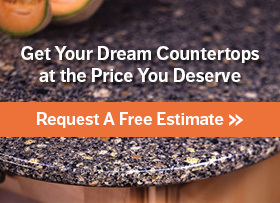 We’ve been in the countertops business for a long time and our experienced contractors can share some tips with you that will help you save even more when you contact us today! Want to discover some of our favorite bathroom countertop ideas? If you’re ready to get started on your bathroom countertop replacement call 410-712-0601 today, or click here to request your free bathroom countertop replacement estimate. Express Countertops is the leading bathroom countertop design and installation service in the Maryland, DC, and Northern Virginia area. Contact us today to learn how our 1-Week Installation Guarantee, can transform your bathroom in no time at all.